uMark is not just a photo watermark software, it can also convert, rename or resize your photos in bulk. Here's how. uMark can convert images from one format to another. You can take an image in BMP, JPG, PNG, GIF or TIFF format and convert it to any other format. Why should you convert image formats? Certain formats are good for certain uses or certain mediums. BMP is the format of Microsoft, best quality but huge size. 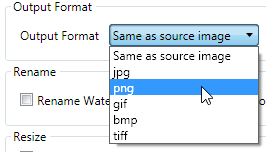 If you want to share a BMP image online you should convert it to PNG or JPG. 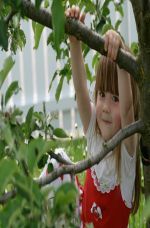 JPG is good format for photos. You can even control the level of compression for JPG. ore the compression smaller will be the image size and also the quality of the image. A JPG image with 80% compression is a good balance between quality and file size. PNG is good both in terms of quality and size and also has support for transparency. Although if a photo is very detailed, saving it in PNG will take more space than JPG. GIF is good old format of the web. It has support for transparency and also for animations. However when you convert animated Gifs to any other format, only the first frame is saved and rest are lost. TIFF is good for scanned documents especially text. It is good for printing. Converting a bunch of images from one format to another is super easy with uMark. Just select the images you want to convert, you can either add individual images or you can select an entire folder full of images including sub folders. 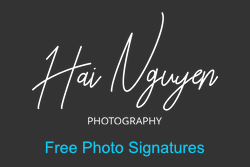 Once you have selected the images, click on the Start Watermarking button. You may add a watermark if you wish, if you just want to batch convert, you can skips the watermarks. When you click on the Start Watermarking button you will see the output options window. Here you need to specify the folder where the converted images will be saved and select a format for the images from the drop down. And that's it! Click on the Start button and all your images will be converted to your selected format. Renaming images in bulk is just as simple with uMark. Again select the images you want to rename and click on the Start Watermarking button. On the output options window, select the checkbox for renaming images. Now you can specify the naming format for the images. You can use a number of different dynamic macros to rename your images. For instance if you want the selected images to be named in a series of numbers like 001.jpg, 002.jpg, 003.jpg and so on, you can use the macro [###]. Or if you want them to be named MyPhoto-01.jpg, MyPhoto-02.jpg etc, you can use the macro as MyPhoto-[##]. 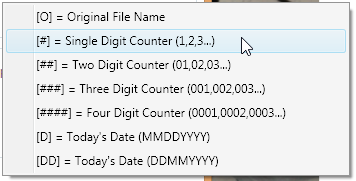 If you want to add today's date to the image name you can use the [D] or [DD] macros. If you want add a prefix or a postfix to the original image name you can do so with the [O] macro. You don't have to insert the file extension. It will be added automatically depending on the output type you have selected. It is a good idea to resize your images before you post them online. Default images taken with digital cameras these days are large enough to print a wall sized poster. You don't need to upload such a large image on the Internet. It will take a lot of time for you to upload and similarly will take a long time to load on the viewer's device. Resizing multiple images with uMark is very simple. Select the images you want to resize, click on the Start Watermarking button and on the output options window select the Resize watermarked images option. There are a number of ways in which you can resize images with uMark. 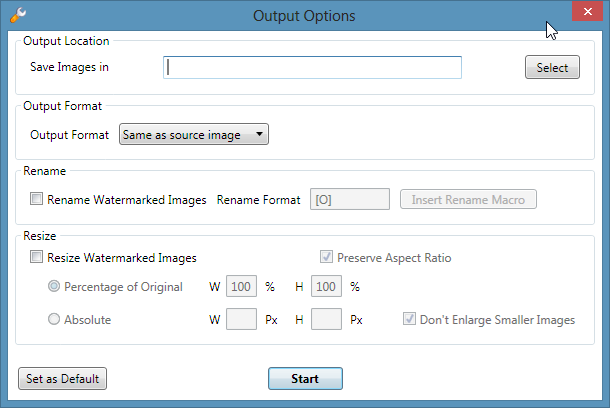 If you want to resize images proportionate to their original size you can select the Percentage of original option. Here you can specify a value between 1 and 100 and the image will be resized accordingly. If you have selected the preserve aspect ratio option then the images will be resized both horizontally and vertically in the same proportion. This is recommended. Because if the aspect ratio is not maintained then image can get distorted. If you want to resize images to a fixed size say all photos should have width of 500 pixels then you can choose the Absolute option. Here you can specify the height or width in the absolute pixel terms and the images will resized accordingly. Again if you have chosen to preserve the aspect ratio you only need to specify either the height or the width of the image and the other dimension will be calculated automatically depending on the size of the actual image. If you do not select the preserve aspect ratio option, you need to specify both the height and width and all the images will be resized to those dimensions regardless of their actual size. So as you can see renaming, resizing and converting images is super simple with uMark and you can do all of that at once with or without watermark. Just add your images and convert them to a different format, rename them or resize - all at once with the click of a button!